Steem Monsters: Increased rewards at the end of each season. This is probably the best time to get onto Steem Monsters if you haven't already. With the new season, changes have been implemented to not only improve the game play but also to rewards people that do well in the game. Now, rewards in each league position increment by +5. 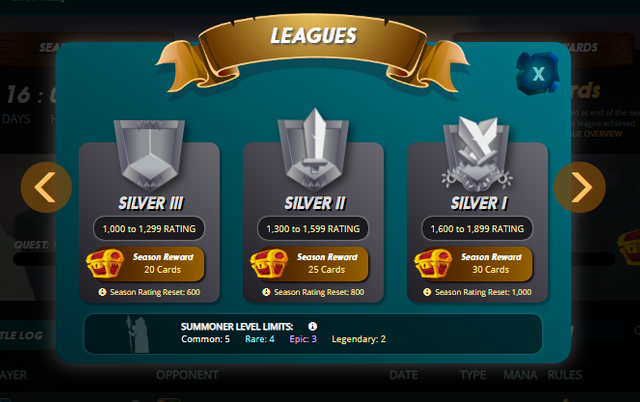 For example, Silver II last season gave only 5 card packs. This season the laegue position is worth 25 card packs. That means you are getting 125 new cards in your arsenal at the end of the season which will help you upgrade your monsters very easily. This couldn't be a better time to get started. In addition to that we have the new Reward Edition Cards that you get from playing daily quests. These cards were introduced this season as measure to curb the problem of people farming beta cards on different accounts. But that is not their only role. These cards contain new monsters with some having new abilities that you can incorporate in your battle strategy. Upgrading this monsters will be relatively easy and they will probably go for a cheap price on the market since the supply is likely to be higher than the demand and because you can get them for free by playing the quests. So, get started as soon as you can and start building up the value of your cards and earn plenty of rewards. If you would like to support me feel free to use my affiliate link to Steem Monsters which will help me out in a small significant way. Congratulations! This post has been upvoted from the communal account, @minnowsupport, by deniskj from the Minnow Support Project. It's a witness project run by aggroed, ausbitbank, teamsteem, someguy123, neoxian, followbtcnews, and netuoso. The goal is to help Steemit grow by supporting Minnows. Please find us at the Peace, Abundance, and Liberty Network (PALnet) Discord Channel. It's a completely public and open space to all members of the Steemit community who voluntarily choose to be there.